Nokia pits its very first phablet against the industry standard. A couple of years ago, the idea of having an oversized smartphone (or a “phablet”) sounded a bit crazy. Nevertheless, this particular market segment grew, and continues to do so with every passing year. As most of you already know, the phablet concept has been made popular mostly by the Samsung Galaxy Note series. However, this year Samsung’s exclusivity over this market segment came to an end, as a handful of other smartphone manufacturers have joined the competition. HTC recently launched the One Max, Sony released the gargantuan Xperia Z Ultra, and believe it or not, Nokia has taken an interest in the phablet niche as well. Several weeks ago, the Finnish company lifted the veil on its first oversized device, dubbed the Lumia 1520. This particular handset represents quite an achievement, not only because it’s Nokia’s first phablet, but also because it’s the first Windows Phone phablet. More so, the Lumia 1520 is also the first WP device to take advantage of quad-core processing and a full HD display. Things are becoming quite interesting in the Windows Phone world. However, we can’t deny the influence of the Note series, and as most of you already know, the Galaxy Note 3 was released a couple of months ago. The question is: how does the Lumia 1520 fare against Samsung’s iconic phablet? Let’s find out. It used to be that Windows Phone hardware wasn’t as impressive as what you’d find on an Android phablet, but the situation has definitely changed. The Lumia 1520 is a prime example of that, and the handset is truly worthy of competing with the most powerful smartphones on the market. The 1520 features a Snapdragon 800 quad-core processor clocked at 2.2 GHz, an Adreno 330 graphics chip and 2 GB of RAM. There are also 32 GB of internal storage (except for AT&T’s variant, which packs 16 GB), with a microSD card slot allowing the user to expand it by up to an additional 64 GB. The Nokia phablet delivers an IPS LCD display measuring 6 inches and boasts a resolution of 1080 x 1920, resulting in a pixel density of 367 PPI. In contrast, the Samsung Galaxy Note 3 features a similar Snapdragon 800 quad-core CPU, but this one is clocked at 2.3 GHz. There are 3 GB of RAM on-board, and an Adreno 330 GPU handling the graphics. However, as is tradition, the Note 3 comes in multiple variants, one of which delivers a different hardware setup. The “N9000” model number features an Exynos 5 Octa 5420 SoC, coupled with a Mali-T628 MP5 graphics chip. Regardless of which model we’re looking at, the Note 3 offers three storage options – those being 16/32/64 GB – s and features a microSD card slot that allows the user to expand it by up to an additional 64 GB. The Galaxy Note 3 boasts a Super AMOLED display with a resolution of 1080 x 1920, but since this panel measures 5.7 inches in diagonal, the pixel density is slightly higher than the one on the Lumia 1520 – for a total of 386 ppi. In reality, though, you won’t be able to tell the difference. For the Lumia 1520, Nokia has prepared a Li-Ion 3,400 mAh battery that promises up to 768 hours of stand-by and up to 27 hours of talk time. The Note 3 is equipped with a 3,200 mAh Li-Ion battery that is rated at 420 hours of stand-by, and 21 hours of talk time. Assuming that your smartphone’s camera is an important component, then you might already be familiar with Nokia’s ability to deliver great shooters on most of its high-end smartphones. The Lumia 1520 is no exception, as the phablet takes advantage of a 20 MP sensor with optical image stabilization, dual-LED and Carl Zeiss optics. The unit features a 1/2.5″ sensor and takes advantage of PureView technology. The main camera of the Note 3 is not as impressive, and although the Snapdragon 800 variant is capable of recording [email protected] videos, the rest is standard fare. The unit is of the 13 MP kind, it lacks dual-LED flash (though it has a single LED flash), and also lacks optical image stabilization. The SG Note 3 offers only an average day-to-day smartphone camera. As far as software goes, I think it’s self-explanatory that the Lumia 1520 runs on Windows Phone 8, and that the Note 3 is an Android device (specifically, version 4.3 Jelly Bean out of the box). Whichever OS you should pick is up to you. There are, however, a few points that I should make. You may have noticed that the Note 3 has 3 GB of RAM, whereas the Nokia phablet delivers 2 GB instead. You may think that the Note 3 is at an advantage, but that’s not necessarily the case. The Android platform in general, requires more RAM than Windows Phone 8. Also, Samsung’s TouchWiz UI can hit the RAM quite hard, and that’s probably the main reason why the Note 3 does need an extra GB of memory to begin with. As for productivity, it appears that the Note 3 is once again a winner, simply because it features an S Pen stylus bundled with a handful of productivity tools. The Lumia 1520 is not as lucky. In conclusion, both the Lumia 1520 and the Note 3 are two very powerful, top-shelf phablets. They are, however, very different in terms of design, productivity, multimedia features, and software. 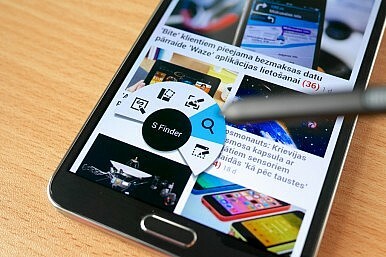 I’d say that, if a stylus pen is what defines a “phablet” in your opinion, then the Note 3 is the way to go. But, if you’re not bothered by the Windows Phone platform and if you want a good all-around device that also packs a decent camera, then the Lumia 1520 might be the better choice. In any case, it’s quite difficult to recommend one device over the other, so we’ll leave this one up to you. Which one of these two phablets would you buy, and why? Don’t hesitate to share your opinions below.